No name brings ancient Africa to mind more than Timbuktu, a great city that flourished on a bend in the Niger River for more than four hundred years. Timbuktu was at the end of the camel caravan route that linked sub-Saharan Africa to North Africa and Arabia. Gold, ivory and kola nuts passed through Timbuktu, but the most important commodity was salt. Timbuktu was located near several salt mines in the Sahara Desert. Caravans hauled salt from the mines to trade for gold. Timbuktu began as a trading city, but in time it developed into the educational and spiritual center of West Africa. By 1330, Timbuktu became part of the Kingdom of Mali. Mansa Musabuilt a great mosque, or Islamic temple, in Timbuktu. The mosque attracted scholars from as far away as Saudi Arabia. Timbuktu began to decline in influence when the Portuguese showed that it was easier to sail along the coast of Africa than travel through the desert. The city was destroyed at the end of the sixteenth century by the war between Morocco and Songhai. At one time, historians estimate that more than 100,000 people lived in Timbuktu, but today it remains a shadow of its former self, a mud-built town of 20,000 people on the edge of the Sahara Desert. The Djinguereber Mosque is Timbuktu’s most famous landmark. 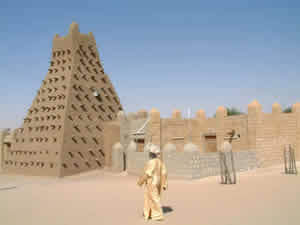 The original mosque was constructed in 1327, during the reign of Mansa Musa. 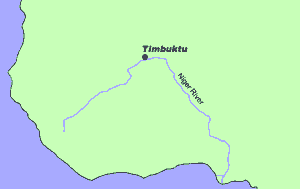 Timbuktu is located on a bend in the Niger River in the modern nation of Mali. More than 100,000 people once lived in Timbuktu, but today it is a small town of 20,000 people on the edge of the Sahara Desert.